In the previous tutorial, we have learned about JSP Directives. In this tutorial, we will learn JSP Exception Handling. Before discussing Exception Handling in JSP, let's first understand what is Exception and how it is different from errors. An exception is an event, that occurs during the execution of a program, that disrupts the normal flow of program instructions.when an error occurs within a method, the methods create objects and hands it off to the runtime system. The object called an exception object. It contains the information about the error, including its type and state of the program when the error occurred. Exception Handling is the process of handle the errors that may occur during runtime. Most of the times errors are not caused by our program these are caused by system resources. We cannot handle the errors. This attribute is used to inform the container to jump the control to another JSP page if an exception occurs in the current JSP page. The another JSP page is used to handle the exception that is occurred in the current JSP page. This attribute is used to inform the container that makes a JSP as an error page or not. The default value of this attribute is false. It means a JSP page is not acting an error page by default. 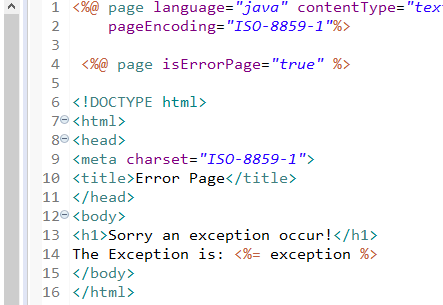 To make a JSP page as an error page than we should write isErrorPage = "true" If isErrorPage = "true" then only execution objects is allowed into a JSP page. In this example, we are creating the 3 files. 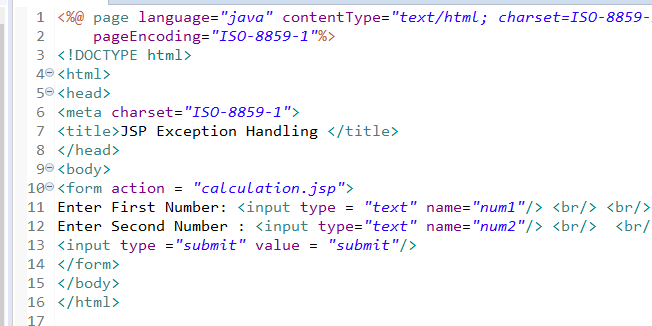 1. index.jsp: for input values. 2. calculation.jsp for dividing the two numbers and display the result. 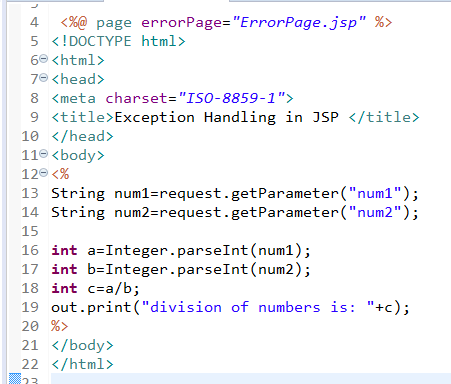 3. error.jsp for handle the jsp exception.